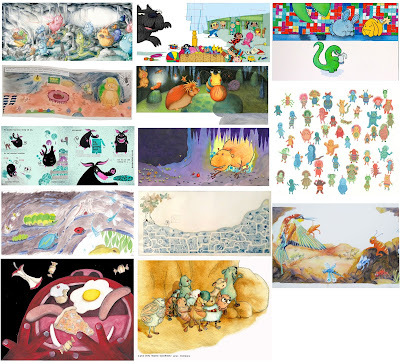 This year I helped organise a picture book illustration master class with Sarah Malley, Art Director from Egmont Children’s Books, writes Heather Kilgour . The workshop had two phases. First, Egmont provided the fifteen illustrators who had enrolled with a picture book text that they had commissioned. The Illustrators produced black and white roughs of character studies and two full page spreads from the story, which were submitted to Sarah for feedback. Then the illustrators used this feedback to produce final colour illustrations which they brought along to the workshop. 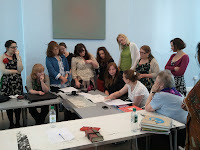 Sarah started the workshop with a summary of what Egmont do, along with examples of what she is looking for in artwork. We then gathered round as Sarah reviewed and critiqued everyone’s colour work. To complete the day she showed as the work of the illustrator that Egmont commissioned for the book. Illustration can be a lonely business so I always jump at the chance to get feedback about my work especially if it’s from an industry professional. Unfortunately other deadlines prevented me from participating, but I have interviewed Anna Violet, Julia Woolf and Shana Neiberg-Suschitzky, about their experience. Below are their paraphrased answers. A: It was great to get feedback half way through a project, and have a chance to work on a new text. It also gave us the opportunity to meet Sarah Malley and get feedback in person. J: It sounded interesting and SCBWI events are always good value for money. You always gain something even if you think you won’t. S: I went to build my folio and get experience. In effects it’s like a commissioning opportunity where you work with a brief and a publisher and get feedback. A: It was great to see what everyone else had done as they all had completely different takes on the story, and then to see the one that Egmont commissioned. J: Sarah was very positive. S: It was great to feel like part of a community, to see what fourteen other illustrators came up with from the same idea, and to get an idea of what publishers are really looking for at the moment. Sarah was so generous about giving advice about the industry and how we can improve ourselves to get through the door. What was helpful for you? A: Feedback on character design. J: It wasn’t a pitch so I could experiment and do what I wanted. It was a complicated story with lots of characters and no art direction to go by so it was up to you. It was a real challenge; you had to just go for it. S: The advice she gave us and the feedback on our work. Has it inspired any long term changes in your work? A: I’m going to try to make my characters funnier. What would you say to recommend it to others? A: Sarah brought promotional work so we could see that she likes, and what works for Egmont. It’s a great opportunity to meet an art director and get direct feedback. You learn a lot from seeing other peoples work and hearing Sarah’s response to it. J: It made me produce some work I’m really pleased with. You can’t lose really, you get to put work in front of a publisher and get a reaction, and even if it’s not a positive one you can learn from it. S: It was a vital wonderful opportunity. No other society generates these types of workshops and events that can really benefit you. SCBWI illustration events are special and unique and it’s all down to Anne-Marie. Thanks Anne-Marie and Sarah Malley! And to all the participants who made it a fabulous day. Heather has been an artist, a blacksmith, a film sculptor and now a picture book maker. She has embarked on an MA in children’s book illustration at Anglia Ruskin College in Cambridge – which might be the start of a collection, as she already has an MA in Fine Arts. Thanks for your write-up Heather. 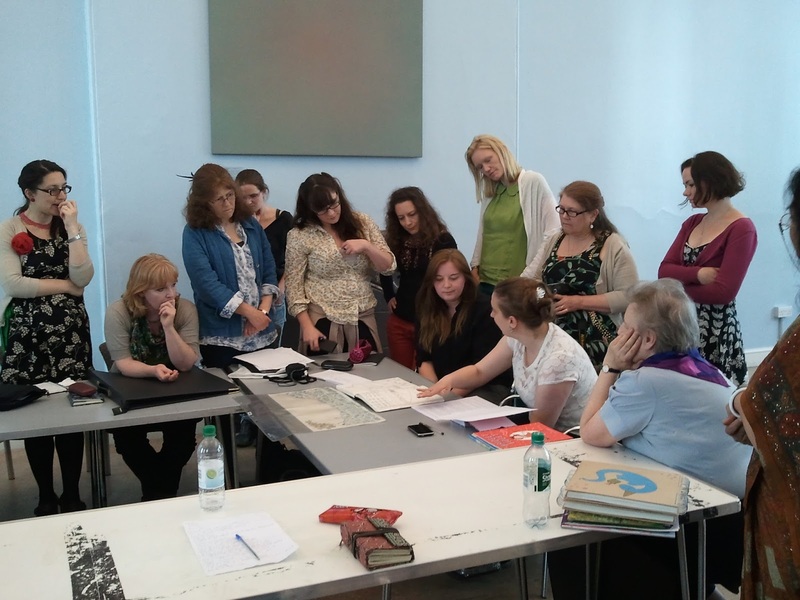 It was great to see those wonderful images the group created - a worthwhile masterclass. And no doubt fun too! All the best in your studies. Thank You, Heather another great ad for SCBWI events! And thanks to you too, Heather, for helping to organise this event. thanks for the feedback Heather. This is an amazing post. I remember reading it as a comment.